In an effort to come to grips with the apocalyptic destruction and inhumanity of World War II, a variety of philosophic, literary, and dramatic movements arose, including nihilism, existentialism, and theatre of the absurd. 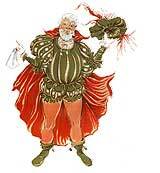 From this latter group came, most notably, Samuel Beckett, Eugène Ionesco, and, following them, Harold Pinter. Given the current global level of violence and hypocritical moral posturing, it's no wonder that the popularity of this genre remains, as evidenced by two Pinter productions that opened last week. Menacing and enigmatic in his early work, Pinter's drama is marked by tight, naturalistic dialogue that sets up emotionally charged moments of excruciating silence. In The Homecoming (1965), now in production at the Germinal Stage, the playwright explores the base instincts that underlie human behavior. Ostensibly, the story concerns the visit of college professor and his wife to his family and boyhood home, but this return quickly degenerates into a psycho-drama driven by prehistoric protocol. While simultaneously shocking and ridiculous, one cannot escape the fact that Pinter, a Jew who grew up in London during a time of Fascist demonstrations leading up to the Holocaust, has drawn his characters from real life. At the center of this carnal carnival is the patriarch Max, an edgy psychopath, equal parts seething and charming in the hands of Ed Baierlein, who also directed. Augustus Truhn, as brother Lenny, is a chip off the duplicitous block, covering his sexual hunger in a cloak of civility. All this to appear as the equal to his cultured and apparently evolved brother Teddy—Mark K. Moran's erudite foil—who, along with his uncle, John Seifert's quick-witted Sam, can only tut-tut and disassociate themselves from such a primordial brood. Even Joey, Thomas Borrillo's hulking, dim-witted pugilistic youngest brother is drawn into the fray by this intemperate loosening of manners. Finally, it is the smoldering allure of Jamie Powers' surprisingly ruthless Ruth, the professor's wife, around whom all this testosterone and adrenaline is expended. 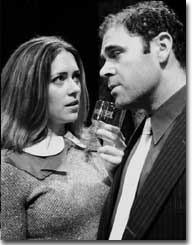 Thirteen years later, Pinter's storytelling had evolved into a less enigmatic and more direct style, yet Betrayal (1978), now being performed by the Denver Center Theatre Company, is also centered around an attractive, intelligent, and duplicitous woman. Annette Helde is Emma, an art gallery manager, married to Robert, a publisher, and paramour to Jerry, a literary agent and Robert's best friend. Despite her precarious and morally compromised situation, Helde's Emma confines her angst to those moments of crisis when her relationships are threatened; otherwise, she is alternately enamored and girlish with her lover and devoted and supportive with her husband. As the tale devolves in reverse chronological order, we are gradually introduced to the trail of betrayals that led to the dissolute state of the opening scenes. John Hutton, as Robert is relaxed and magnanimous toward Jerry, despite his friend's indiscretions, belying his earlier outrage, while Jamie Horton's Jerry is never far from his original sin, despite his ardor for Emma and his camaraderie with Robert. But most notably, director Anthony Powell has parlayed the familiarity and trust between these three actors, who have worked together on numerous occasions over the past two decades, into the quintessential moments of non-verbal communication for which Pinter is famous. Each scene is arranged by the actors themselves, who are seemingly given to choose the setting and interactions that take place, with the excluded actor left offstage to observe and analyze the other two; caught in each other's emotional clutches, whenever the dialogue stops, the subtext of their emotional fireworks is deafening. Based on this dramatic symbiosis, executed to perfection in this production, it's no wonder that many consider Betrayal Pinter's most mature work. Germinal Stage Denver's production of The Homecoming runs through May 5th. 303-455-7108. The Denver Center Theatre Company's production of Harold Pinter's Betrayal runs through June 1st. 303-893-4100.